Back in the early 70’s, the City of Naperville passed an ordinance which mandated that developers pay a fee or provide land, to accommodate the effect the development will produce. Land could be used for parks, schools, or community enhancement. The concept worked quite well as Naperville’s growth era boomed. However, now nearly a half-century later, most of Naperville’s larger plots of land, have been developed, leaving smaller plots for smaller developments. For smaller developers, these opportunities can be trickier when it comes to finances and specifically the impact fee required by the City. The word ‘impact’ is defined as ‘something coming in forcible contact with something else’. In this case the ‘something’ is the City of Naperville, and the ‘something else’ is the developer. We know who typically wins that one, unless of course it goes to court as in the case of the Smart Meter lawsuit, when the resident prevailed. The impact fee is not a court candidate. However, the fee should be a candidate for reconsideration by the Naperville city council. The economy is sluggish, and the little guy needs a break, in this case the developer is that little guy, that could use a break. During the last Naperville city council meeting, developer Paul Troppo of Naperville asked for a break, for the $125,000 impact fee he is required to cough-up to city officials. He’s not asking for the fee to be waived, or reduced. He simply would like to pay the fee when he obtains his building permits, rather than when his plans are submitted. It seems like a reasonable request. Typically Naperville city officials want, what they want, when they want it, which typically is now. If money is coming in, they want it yesterday. If money is going out, well that can wait til sometime in the future. Unless, of course, the City is hauled into court and required to make residents whole again. There are few of those situations coming down the pipeline. The only Naperville council member willing to show support for the developer’s request, is councilman Kevin Coyne, who said, “We’re not taking money away ‘from the city’, we’re simply delaying it”. Government compassion is an oxymoron, but councilman Coyne, in this case, is willing to ‘stand up’ for compassion and understanding. That’s good news. The not-so-good news is that it will require four more council members with compassion to join him. The Naperville city council had an opportunity to change the date of their Tuesday March 15 meeting, which was Super Tuesday on the primary calendar, but they decided to keep the date even though the State of Illinois was one of those primary states. Councilman Kevin Coyne brought the topic up for discussion, mentioning he favored the move, but when it came time to vote, it was unanimous to keep the date as planned. Ironically even Coyne voted not to change the meeting date. It’s possible Coyne was focusing on primary results, maybe looking for high school basketball super-sectional scores, paying some bills online, or catching up with the Real Housewives of Beverly Hills. You would think that a Naperville city councilman knows the city quite well including the locations of buildings, landmarks, businesses, bars, restaurants, schools and much more. Apparently this is not the case with Naperville councilman John Krummen. Back-to-back girls basketball State Championships for Benet High School is a tremendous accomplishment indeed, however Krummen shot an air ball when he said “we have another state champion in the city”. 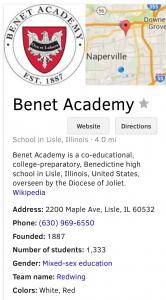 The city of Naperville doesn’t because Benet High School is located in Lisle, Illinois. We may have to give Krummen the benefit of doubt if he knows something the rest of us don’t know, which could be that Naperville is annexing Lisle. However when Lisle city officials were contacted, the idea of annexing Lisle was considered premature. When asked if they were willing to trade Benet High School for Naperville’s smart meters, they said only if Naperville would include the Riverwalk. It was suggested that councilman Krummen may want to purchase a map, and/or take a look at Naperville and Lisle from an elevated perspective. If Krummen had been on the city council between 2006 and 2011, he could have announced more state championships for the City of Naperville when the Bolingbrook high school girls team won four state championships during that time. Saturday night, the Benet boys high school basketball team played for the state championship. Though Chicago Curie won the game, it could be another possible state champion announcement by Krummen for Naperville. On a map, Chicago is only two inches from Naperville; that’s close enough. Typically when you hear “you have to hand it to Naperville city officials”, most folks would think more money is going from residents to the City, in the form of fees, fines, taxes, penalties, you name it. But not this time. This time city officials have uncovered money owed to Naperville from Dupage County. It was just a couple of months ago what residents began to notice they were being charged a fee by the city for garbage pick-up, when in fact those residents were not using the city service. Just as residents are owed money from the City of Naperville, the City is owed money from Dupage County. You have to hand it to Naperville city manager Doug Krieger and his staff for uncovering lost money due the City from Dupage County. Naperville city officials determined through research that Naperville was being shorted several hundred thousand dollars annually in fine reimbursement from the county. It’s amazing what a couple of misplaced decimal points can do, along with a couple of missing ‘zeros’, and some mis-keyed data entries. Krieger and staff noticed a decrease in revenues from traffic violations over the past several years from the county to Naperville. Several years ago the revenue was about $3.7 million, and last year it was down to $1.7 million. That was a huge loss for Naperville residents. But now those misplaced dollars are finding their way back home to Naperville. That’s good news for Naperville city officials, and it should be good news for Naperville residents. We’ll have to wait and see if city officials will now allow residents and groups to use municipal meeting rooms without charging a rental fee to do so. After all, it’s the residents who provided the funds through taxes to build it. It is not very often that people born during the 21st century speak during a Naperville City Council meeting. When it does happen, the council seems reluctant to use the word “no”. Neuqua Valley Students Conner Tenney and Andy Wang (among others) approach the council with a novel idea about how to improve the city and the branding. This was a nice presentation by the two young men who clearly stated their inspiration and objective. While re-branding can be a good thing, it also comes with great price. If you think back to the gold rush in the 1800’s ask yourself, who made all the money. The answer: The person who sold the shovels. When it comes to re-branding, who stands to gain? The answer: The person who prints the business cards. But it goes further as the city logo is such a coveted representation of Naperville, that making this change would cause more than a few things to have to be adjusted. Think of all of the things that should be taken into consideration before the change to the “current” logo should be approved. If the potential financial repercussions are of no concern to the council (after all it is not their money), then perhaps the council should approve any logo. As stated by Councilwoman Becky Anderson, she would be proud to fly whatever is decided in front of her business. While there are many problems within the city, I think the logo ranks low on the list. Spending money on non-essential problems doesn’t seem to make the most sense. All of this could have been resolved by simply using the power of the word “No”. The students seem to be confident young men and would accept the word and the honest feedback. If the council were to approve the change, what is to stop students of Naperville Central requesting a change a few months after the re-branding is completed. Why not change the name of the city while they are at it? A basic understanding of how electric works is always helpful. Knowing not to stick a fork into an electric outlet is an example. Also knowing, or least having a good idea, that when you flip the light switch, the lights will go on, and if you flip it again they will go out. Other than that, most of us are content when it comes to anything electric, with the exception of getting our electric bill. Year after year Naperville city officials have been unapologetically jacking up electric rates. Not by 1% or 2%, but by 6 to 8%, and there is no end in sight. It’s no surprise that Naperville’s Electric Utility is in financial disarray. This is the result of less than competent city officials over the years making less than wise decisions about just about anything electric including entering into a horrendous contractual agreement with IMEA (Illinois Municipal Electric Agency). Most of those city officials are gone, however a few remain on the city council including Judith Brodhead and Paul Hinterlong along with a few other city officials still roaming in the inky shadows of city hall corridors. A saving grace for the users of Naperville’s electric utility was supposed to be the use of Smart Meters, yet you can’t find one resident or business that has saved a penny since they were forcefully installed. Council member John Krummen, as a mouth piece, enthusiastically voiced his support for Smart Meters, but any so-called benefit has yet to be realized for users. The only defining result for the heavy-handed installation of smart meters, was a law suit filed by a Naperville resident against the City of Naperville, with the resident winning and the City losing in court. So not only have residents not saved a penny with smart meters, they have lost money with yet another bad decision by city officials. For a number of years a good number of residents have been advocating for the City to sell the electric utility and short-circuit losses, but those requests have resulted in crickets. However, now with a new mayor, and a 75% new city council, calmer and wiser decision makers, including Naperville city manager Doug Krieger, are exploring opportunities to do exactly that. Common sense would indicate that Com Ed would be a candidate for the City of Naperville to unload its electric utility. If it’s a choice between the City of Naperville retaining its electric utility or pulling the plug and selling it to Com Ed, it appears that the bad choice of selling to Com Ed might be the best choice for the City of Naperville and its residents. Baseball season is right around the corner, and each year the idea of adding a designated hitter to the National League becomes a topic of conversation. The American League uses a designated hitter, to hit in place of the pitcher, but the National League doesn’t, meaning National League pitchers have to hit. Having been a pitcher myself while playing semi-pro ball back when dirt was new, I would not have been in favor of having designated hitters, not that I wanted to hit, but because the last thing I needed was to have to face another good hitter in the opposing team’s line up. I always had aspirations of making the Big Show, but the further I moved along in semi-pro, the more often my pitches hit the hitters’ bats, resulting in some impressive long balls leaving the ball park in a rush. Too often I was in awe of watching a ball, that I had just pitched, sail over the light standards into the night. I’m still not a fan of the designated hitter, however I am a fan for the designated resident at a city council meeting. It’s a simple concept to get more people involved in local government by having one resident selected to ask questions to council members during a meeting while they discuss agenda topics. It could be similar to a coach’s challenge in football, or asking for a replay in baseball. Questions would be limited. And council members would be allowed to avoid a question by asking for a 10 minute recess, which could increase the length of meetings by about two hours. There are so many questions residents would like to ask and have answered. Council members don’t ask each other any questions. They just vote (usually unanimously) and make comments without any type of challenge or clarification from other council members. It’s no wonder they can do a meeting in less than 45 minutes. Quick meetings are great, but when so much is left unasked or unanswered, residents are not getting their money’s worth .